With workplace stress seemingly running high for many people, it is little wonder that there is a temptation to look beyond the humdrum every day and to a time when the stress will be gone and the days can be savoured. 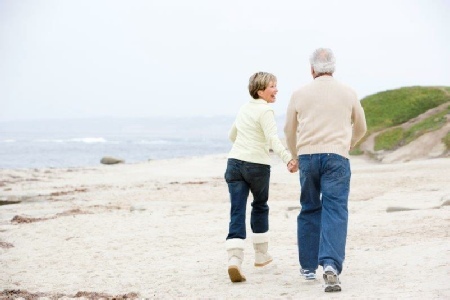 Retirement - the golden years - is a time when relaxation can be the primary occupation and life can be taken more steadily and enjoyed to the full. The retired clients I see at Ashwood Therapy speak of the idyllic picture painted above on the one hand, yet also of new challenges that come when work leaves. Many people gain a sense of purpose, of position and of utility in the workplace which can be uncomfortable to let go of. Although you may refer to yourself as an "ex-salesman" or "former dentist", for many it seems that these past titles do not have the same meaning as when they were being lived out day by day. The alarm clock no longer needs to be set for 6:30 a.m., and really it wouldn't matter too much if you were to lie in until 10 o'clock or later. While this might sound like bliss to those at work, in my experience clients can often feel a little lost and adrift when this is potentially their routine seven days a week. While there are some that can afford to retire early in life (lottery winners and wealthy city bankers, perhaps? ), for the majority of people retirement comes when they are advanced in years. Unfortunately, health issues related to age can also spring up around this time, leaving people physically or mentally less robust than they once remember being. Add to this the fact that a pension or retirement income is most likely to bring in less than a salary from a full-time job, and suddenly the golden years can seem a little less bright. In my experience providing therapy to older clients, one thing has stuck out to me above all else. I have remarked on several occasions how retired clients seem to gain great strength from having a firm sense of purpose in this new chapter of their life. Some have made being retired into their 'new job', and although they may not rush about as much as they did when they were younger, they are seldom at a loss for how to fill their time. Although they have lost what for some was a lifelong occupation, new avenues can be identified, explored and developed in therapy, leading to great fulfilment and satisfaction. Adapting to challenges brought by new health conditions and acceptance of a need to budget differently can all be worthwhile topics of confidential conversation between client and counsellor. Making a positive difference in their community in the form of voluntary work, helping their own children with younger grandchildren or spending time learning new skills and pastimes are all activities that clients have reported as being immensely rewarding. Although I am not yet at an age where I am looking to retire, I have learnt a great deal from the sessions I have collaborated in with people facing retirement and the different pace of living this can bring. With a few changes in lifestyle and perspective, it seems that the golden years can shine very brightly indeed.